How can 2017 have come and gone so quickly? It seems each year flies by forever faster. Despite the rapidity of it’s flowing, 2017 has been a momentous year for me and my blog. I have a new home in a new county and I’ve started a new job. Tin and Thyme has had to take a bit of a back seat during this time, but I’m hoping it will be running on all cylinders in 2018. Thank you for your forbearance. Meanwhile we have 15 new year chocolate recipes to tempt you in this month’s We Should Cocoa round-up. 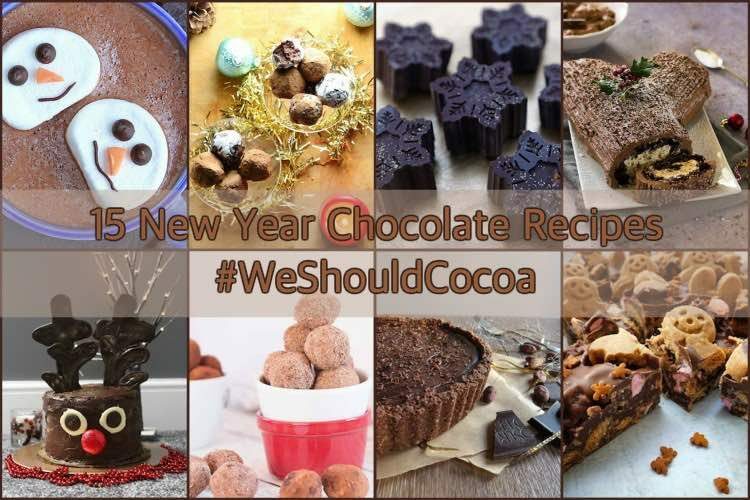 If you’d like to join in with next month’s #WeShouldCocoa, scroll down to the bottom of the post and you’ll find the January link-up. If you haven’t joined in before or need a reminder, you can find the guidelines on the We Should Cocoa page. I’d just like to say a heart felt thank you to everyone who’s visited my blog, especially those who have commented and/or made any of my recipes. I wish you all a chocolate rich 2018 and hope you all have a fulfilling and Happy New Year. I hope you enjoy these 15 new year chocolate recipes below. I reckon there are probably worse ways to go than death by chocolate. A slice or two of this rich and smooth salted chocolate tart from Gluterama would hopefully not be it, but would be very welcome. It’s gluten free too of course. I’m unable to resist rocky road or tiffin at the best of times. This gingerbread men rocky road from Foodie Quine would make it downright impossible. If you’re needing inspiration for next year’s Christmas cake, how about Rudolph’s red nose chocolate cake from Mummy Mishaps? With a hidden surprise, it’s bound to be popular. Chocolate truffles are an essential part of any celebration in my book. These vegan healthy Christmas truffles from Everyday Healthy Recipes are made with marzipan as well as chestnuts and other delicious ingredients. A big yes please from me. We have more vegan truffles from Nico at Yumsome. This time they come in the form of these scrumptious raspberry chocolate truffles which are made with cashew nuts. Winter is the perfect time for making and drinking hot chocolate. Who could resist this boozy Baileys real hot chocolate with festive Christmas marshmallows from The Gluten Free Alchemist? Not me. An aquafaba chocolate sponge, smothered with chestnut buttercream, rolled up and coated in chocolate buttercream. Doesn’t this ultimate vegan chocolate yule log from The Veg Space sound incredible? Shortbread is another of those items that are essential at Christmas. This buttery Christmas chocolate shortbread from Baking Queen 74 is topped with melted chocolate then sprinkled with crushed candy canes, marshmallows and gingerbread men. Bark Time gives us a rich chocolate and pear cake, which is good at any time of the year, I reckon. Then there are brownies, white chocolate and cranberry brownies from Easy Peasy Foodie to be precise. If you fancy something a bit less Christmassy, sub the cranberries for the dried fruit of your choice. For something a little more ghoulish, how about these clever bloodied chocolates from Cooking with Smile – or strawberry jam stuffed chocolate if you prefer? If you want something that tastes truly decadent but is in fact quite good for you, these chocolate peppermint bliss balls from Cooking With Essential Oils might be just the thing. I don’t think I’ve ever seen peanut butter cups look as pretty as these chocolate snowflake peanut butter cups from A2K – A Seasonal Veg Table. What a wonderful gift to receive. If you’ve never made your own mincemeat, I urge you to try it. Make a pot now and it will be perfect for next Christmas. I vary the ingredients I put into my mincemeat each year, but it always contains chocolate – that’s a must have. This year I went for lemon & ginger mincemeat in the hope it might ward off the winter bugs. It didn’t work! And you can’t have Christmas without chocolate orange. Luckily this is a known known over at Caroline Makes, resulting in the last of our 15 New Year chocolate recipes, Chocolate Orange Christmas bund cake. 15 New Year Chocolate Recipes. PIN IT. Happy new year! What a wonderful selection of festive recipes! I have never cooked with aquafaba. Saw a book in Italy – only recipes with this ingredient, which looked interesting. Mincemeat with chocolate sounds wonderful. Happy New Year to you too Galina. A cookbook for aquafaba sounds like quite a find and a jolly good idea too. Aw thanks Kate, that’s very kind of you. Much as I love Christmas, I’d rather it took a nice long time to come around again. We had rather a fluey one this year with poor CT spending Christmas Day in bed. But we’re looking forward to this new year in our new home. Thank you so much for your wonderful #WeShouldCocoa contributions. They’re always much appreciated. Thanks Shaheen. I know chocolate isn’t really your thing so it’s always a double pleasure for me when you do manage to join in. Thank you for the feature! Hope you had a wonderful holiday season & a Happy 2018! Thank you Heather and thanks for joining in with your lovely essential oil bliss balls. Happy New Year, Choclette! Starting Jan. with some delicious chocolate treats is definitely the way to go! Yes indeed Angie. The cold dark days need brightening up somehow. Happy New Year to you too. Happy new year Choclette! This roundup is certainly full of chocolates delights. Gluterama’s chocolate tart looks gorgeous and droolworthy, as do the other entries of course! Although it is January and my thoughts turn to healthier things I am certain chocolate will feature in a recipe from me soon. Yes, there are always good things to tempt you in the #WeShouldCocoa round-up. Hopefully we’ll be seeing something from you again soon. My pleasure Lathiya. #WeShouldCocoa is all about sharing the chocolate love. Happy New Year to you too Choclette 🙂 I too can’t believe we’re already in 2018! Thanks Angela. Where does that time go? Always love the WSC recipes. Wow, so many amazing looking chocolatey treats! I can’t believe it has taken me this long to read the WSC round up – January is so crazy. But have shared my tree house cake. Am so glad WSC is still going even with all the big changes for you last year – and long may it continue. (Ditto for your blog) Belated happy new year! Gosh these all look incredible! Thanks so much for directing me to this linky! Thanks Donna. Your brownies sound so delicious. Please could I add my mint aero chocolate fridge cake to this delicious list of chocolates goodies! My link is now in, sorry for the delay Choclette!